Evolution Motorsports GT Sport stainless steel headers have been designed to increase HP and TQ on cars making 700+ HP. We also install them on race cars making 650-700 HP. The large radius 44.5 mm primary tube diameter design is perfectly matched for the exhaust travel from the heads to the larger turbochargers for better boost response and power throughout the rev range. The smooth flow through the mandrel bends and pyramid merge collector offer superior flow characteristics as compared to the OEM headers. The larger diameter primary tubes are designed to increase exhaust volume to the turbos while reducing exhaust gas temperatures (EGT’s) to safe levels on high power applications. Power gains are increased up to 30+ HP and 30+ Ft. TQ and EGT’s are lowered by 50 degrees C as compared to the OEM headers. 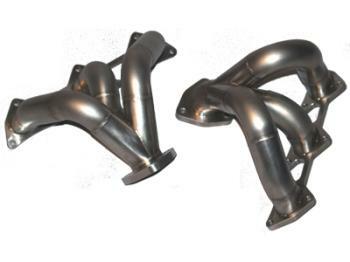 These headers are included in our GT750/800 tuning systems and are an option for the GT700R.